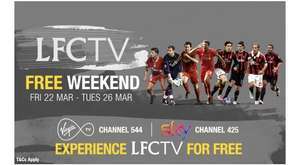 Try LFCTV for FREE between 22 March and 26 March via Sky channel 425 and Virgin TV channel 544. If the post isn't for you then just move on? Banal comments. Liverpool Vs Milan legends game is being shown live tomorrow for those actually interested. Hence why it's a free weekend. Imagine a club rewarding it's fans? Blimey! Sounds like they can't even give it away! Back of the net me son. Am a born and bred Liverpool fan but this is such a tight wad deal ... there's nothing worth watching over the period. If you want to see constant reruns and banal interviews then go ahead. If they really wanted to do something worthwhile they'd have shown one of the big run in games free. LFC legends v Milan game on live right now from Anfield with 54,000 actual fans at Anfield. Well worth watching! Am a born and bred Liverpool fan but this is such a tight wad deal ... …Am a born and bred Liverpool fan but this is such a tight wad deal ... there's nothing worth watching over the period. If you want to see constant reruns and banal interviews then go ahead. If they really wanted to do something worthwhile they'd have shown one of the big run in games free. Ole's at the wheel... en route to the Europa League. Enjoy 5th! Will they show highlights of the season they won the Premier League? If they really wanted to do something worthwhile they'd have shown one of …If they really wanted to do something worthwhile they'd have shown one of the big run in games free. They're not allowed to broadcast live Premier League games. Sky and BT have the exclusive rights to those. They'll show highlights of them winning club football's greatest prize more times than the rest of the top 6 combined. England's only European giant.